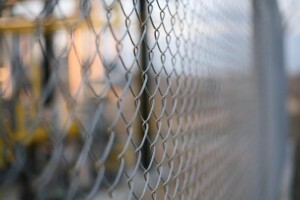 Chainlink fencing is popular in urban areas as well as suburban areas around sports fields. A chainlink fence offers an inexpensive way to surround an area. The material is flexible, it is able to accommodate to various terrains, and it comes in different sizes. But what kind of chainlink fence should you use for your project in Northern Virginia? Galvanized chainlink fences are probably the ones you see more of; the silver, metal-looking wires that kids like to climb up when their mothers aren’t watching the baseball field. This type of chainlink fence holds up to about ten to fifteen years without rusting. Since the fence is sturdy and just galvanized, it requires no maintenance and always meets SATM and federal specifications. Although it gives a rough-and-tumble appearance, galvanized chainlink fences are the most cost-effective type of boundary to put up. Vinyl coated fencing simply means that a layer of vinyl is attached overtop of the galvanized chainlink fence. Not only does it look nicer than the untouched chainlink fencing, it handles weathering better because of the extra layer of protection. Generally, manufacturers offer a warranty against chipping so you are more likely to purchase the vinyl coated fence. In this respect, vinyl coated chainlink fencing is just as maintenance free as galvanized fencing. Vinyl coated chainlink fencing has more curb appeal than standard galvanized chainlink fencing. It has an extra layer of protection to withstand corrosion and weathering. Keep in mind that you are able to choose the color of the vinyl coating you would like on your chainlink fence. Although the cost may be about a dollar and a half more than a galvanized chain fence, it may be worth the extra dough. If you are tight on cash, galvanized fencing may be the way to go. It will still provide you with the sturdiness you need. What the decision comes down to is if you’d like a higher end look or a cost-efficient fence. Hercules Fence can install your chainlink fence. This entry was posted on Sunday, April 19th, 2015 at 7:28 pm. Both comments and pings are currently closed.